Guide your expedition through hazardous terrain and hostile territory, exploring the wonders of Isla Dorada while you compete to find the most treasure among your fellow explorers. Designed by the creative team of Bruno Faidutti, Alan R Moon, Andrea Angiolino, and Piergiorgio Paglia, Isla Dorada is a board game of strategic bidding and exploration for 3-6 players. In Isla Dorada, players join together to form an expedition, navigating through a mysterious and treasure-ridden island. However, since each player is competing to be the one explorer to find the most treasure, they each have their own treasure maps and their own secret motivations. To move the expedition, players bid cards that allow them to move the expedition through certain terrain. Whoever wins the bid gets to move the expedition and potentially find their hidden treasure. Isla Dorada is a light game with grand components which makes it ideal for playing with the family. The game is driven by cards. In your hand you have travel, destiny and treasure cards. The destiny and treasure cards show the locations a player wants to move to as this is how the points are collected on the cards. The travel cards are used to bid to move the expedition with the biggest set of travel cards winning the move. The travel cards are used for different paths (water, desert, jungle) so you are limited by the paths from your current location and the amount of cards you have collected for movement down that path type. You can’t win every bid and it is more about steering the expedition toward locations you want rather than being able to force it there every turn. The fun is in trying to work out where others are wanting to go and preventing that from happening while moving to your target destinations. Oh, and there are curse cards that show locations that will give a player negative points if the expedition goes there. Kaleljorson7 compares the game to Ticket to Ride which I believe is slightly misleading. While the setup and board look similar, in that it is card driven and has locations connected by paths, the game is more chaotic and promotes more interaction between players as everyone moves the same piece. A lot of speculation about where other players want to go to influence the bidding can be very amusing. After every move everyone gets a new card and mixed in the travel cards are special action cards. These can make a significant difference and allow ‘take that’ play to reign in leading players. Ticket to Ride allows the players more control and no discussion is necessary while Isla Dorada requires negotiation skills. It’s a brilliant looking game that is fun for those who do not need total control or information in a game. The unique artwork was the first thing to grab me about this game, it pops off the front and back of the box. The premise of a single pawn piece, controlled by all of the players, was also something that seemed like it could be fun. Just imagining all the debating and deal-making put a smile on my face. A few of the other names attached to the game, such as Alan R. Moon (Ticket to Ride), sealed the deal on this purchase. While Mr. Moon has not always released a slam dunk, the similar card mechanics in Isla Dorada meant that players in my family and my group would be quite familiar with how the game worked, right out of the box. This is a game that I’ve had fun with, no matter who I’m playing with. A tug-of-war ensues, almost every turn, and even if you’re not participating, its certainly fun to watch it all go down. Pitting your fellow players against each other can also make memories that cause you to giggle weeks down the line. The names of the locations on the island are rather ridiculous and fun to watch folks try to properly pronounce. This is a game that will have a welcome home in my collection for a long time to come. This game is my favorite of games I’ve played thus far. I thoroughly enjoy games where it’s the players vs the game. And I love games that pit players against each other. This game has the best of both worlds. Each player has their own set of unique (somewhat) objectives, but are stuck together for the game, and are forced to compete with each other to get their own objectives completed. Also, the artwork is just fantastic, the components are well made. Isla Dorada borrows mechanics from several games and creates it’s own unique kind of fun. Players are part of an expedition on a mysterious island, each turn they bid cards on which path to take. It plays and feels similar to a more fun version of “Ticket to Ride.” The cards show different types of paths to bid on (train cards in TTR), there are different quests to complete (route cards in TTR), and their are 3 cards face up for players to choose from instead of drawing. The plastic figures are excellent and the art is brilliantly colorful and fun. This is a great, underappreciated game. 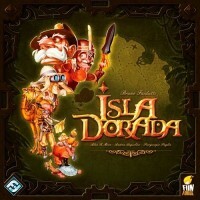 Add a Review for "Isla Dorada"